The genus Melaleuca belongs to the myrtle family (Myrtaceae) and includes about 250 species (including the paperbarks, some of which are cultivated as ornamentals). Most Melaleuca species are restricted to Australia. M. alternifolia bears fluffy, white masses of flowers from spring to early summer, and its narrow leaves help distinguish it from the similar species M. linariifolia, which has wider leaves and flattish-spherical fruits. 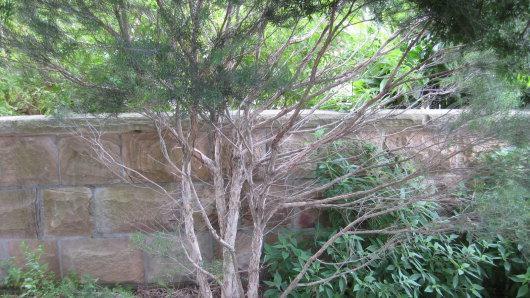 Shrub or small tree 4–7 m tall with soft layered peeling papery bark; branchlets glabrescent. Leaves alternate, linear, 1–3.5 cm long, usually under 1 mm wide. Flowers white, solitary within each bract arranged in many-flowered spikes, terminal or from upper axils. Petals rounded ovate, 2 mm long and wide. Staminal bundles with claw 11 mm long and 30–35 filaments spread all over claw, those at base shortest. The main source of commercially-produced tea tree oil, Melaleuca alternifolia is an efficacious natural antiseptic once heralded as 'a medicine chest in a bottle'. Captain James Cook, the 18th century explorer, is reported to have used tea tree leaves to brew a spicy tea, although the common name 'tea tree' has been applied to several plants in the genera Melaleuca and Leptospermum (also in Myrtaceae), so the exact species he used is unknown. Melaleuca alternifolia is native to Australia, where it is found from Queensland to north-east New South Wales, at up to 300 m above sea level. A tall shrub or small tree up to 7 m high with a bushy crown and papery bark. The hairless leaves are scattered to whorled and are 10-35 mm long by about 1 mm wide. The leaves have prominent oil glands and are rich in aromatic oil. The leaves are borne on a petiole (leaf stalk) of about 1 mm long. The inflorescences are many-flowered spikes, 3-5 cm long, with axes bearing short hairs. The white flowers are solitary, each within a bract, and have petals 2-3 mm long. There are 30-60 stamens (male parts) per bundle and the style (female part) is 3-4 mm long. The fruit is cup-shaped and 2-3 mm in diameter, with a hole 1.5-2.5 mm in diameter, enabling the release and dispersal of the seeds by wind. Fruits are usually sparsely spaced along the branches. Traditionally, the crushed leaves of Melaleuca alternifolia were used by Australian Aborigines to treat skin infections. Today, M. alternifolia is commercially cultivated (especially in north-east New South Wales) for tea tree oil, an essential oil which is used as an antiseptic in skin care products, in the perfume industry, and in soaps and mouthwashes. The oil is effective against bacterial, fungal and viral infections, and is used in products to treat such conditions as athlete's foot, warts, acne and vaginal infections. Tea tree oil is also used for treating respiratory problems, such as asthma and bronchitis. Melaleuca alternifolia makes an excellent hedge and windbreak, and is also planted to stabilise embankments. Its wood is used in construction, and its branches are used for fencing. Related species include M. cajuputi , the source of cajuput oil, and M. quinquenervia (broad-leaved paperbark) which is used for Aboriginal bark paintings and is the source of niaouli oil. Melaleuca alternifolia can be grown in a wide range of soils in sub-tropical climates, but performs best in well-drained but moist soil in full sun. It responds well to heavy pruning. 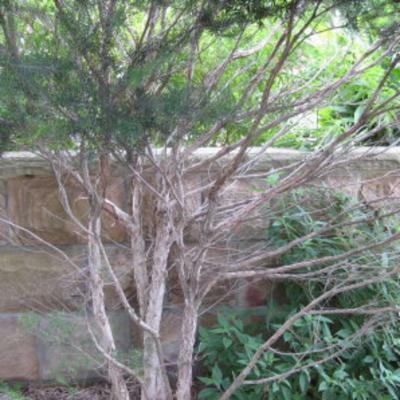 Tea trees are drought-tolerant and can survive flooding and fire, but are not frost-tolerant. Commercial cultivation involves planting seed at high densities and then cutting back the whole plant close to ground level (coppicing) every 6-18 months to harvest the essential oil. The oil is extracted by steam distillation of the leaves and terminal branchlets. Melaleuca alternifolia is not grown at Kew, but other Melaleuca species can be seen in the Temperate House. 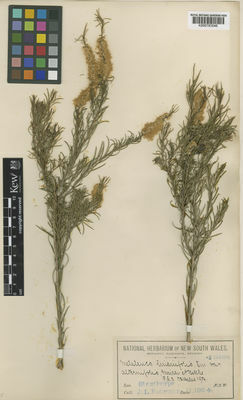 Pressed and dried specimens of M. alternifolia are held in the Herbarium, where they are available to researchers from around the world by appointment. A sample of tea tree oil from M. alternifolia is held in the Economic Botany Collection in the Sir Joseph Banks Building. Melaleuca alternifolia (tea tree) was one of 12 star plants featured in the Landscape, which took you on a journey across a whole continent, from eastern Australia's coastal habitat, through the arid red centre, to the western Australian granite outcrop featuring unique and highly endangered plants. Along streams and on swampy flats, on the coast and adjacent ranges. Widespread and common in the wild. Not evaluated according to IUCN Red List criteria. Pure tea tree oil should not be ingested, and should be kept out of the reach of children; several cases of tea tree oil poisoning have been recorded. The oil can also cause contact dermatitis. Medicinal (tea tree oil), ornamental. World Checklist of Selected Plant Families (2011). Melaleuca alternifolia. Published on the internet by the Board of Trustees of the Royal Botanic Gardens, Kew. Holliday, I. (2004). Melaleucas: a Field and Garden Guide, 2nd edition. Reed New Holland, Sydney. Southwell, I. & Lowe, R. (1999). Tea Tree: the Genus Melaleuca. Harwood Academic Publishers, the Netherlands. Harden, G.J. (ed.) (1991). Flora of New South Wales, Volume 2. New South Wales University Press, Australia.